Welcome to Carefile Medical Systems' Web Site! Carefile was formed in 1984 to address the automation needs of physicians and their staff. With the advent of the personal computer, Carefile began developing systems that brought the power of computing to the medical office. More than fifteen years later, our products continue to evolve (as personal computing continues to evolve) in order to provide increased efficiency to the doctor workplace. Carefile systems have been installed in over 200 hospitals, clinics, and private offices, with over 750 physicians currently using the system. These systems are in use in Québec, Ontario, New Brunswick, Nova Scotia, and in various locations in the United States. Carefile's flagship product is CareOffice -- an integrated suite of billing and scheduling packages available exclusively for the Windows platform. At the moment, CareOffice is only available for the Québec and New Brunswick medicare systems but an Ontario version will be available soon. CareOffice provides a complete electronic billing system fully integrated with a very easy to use and full-featured appointment scheduling system. Full patient and doctor databases are also included. All of the Carefile modules are designed to be easy to learn and easy to use. They have been designed to make data entry as simple as possible and their use will result in significant time savings for both physician and staff. This increased efficiency will result in improved patient and financial management. Please take a few moments to explore our website and see what we have to offer. We thank you for your interest in Carefile. Please Email us if you have any comments, questions or suggestions. As of June 1st, 2016 RAMQ has put into effect a new billing code regime for General Practitioners. The updated billing codes are available immediately and can be downloaded from within your Carefile program (from the main menu go to Tools->Download Billing Code Update). You must perform this update before you create any new claims with service dates on or after June 1st. Note however that RAMQ will only accept these claims on or after June 7th. Please refer to RAMQ's Infolettre 057 and Infolettre 059 (both issued on May 30, 2016) for more information. We have received many requests for information on the intricacies of billing for the new SYRA system and unfortunately we have very little to offer in this regard -- this is the responsibility of RAMQ. But there are a few resources we think will help greatly: The first is from Dr. Michel Desrosiers of the FMOQ who has put together three excellent one-hour videos on the SYRA system and are available here (in both English and French). The 2nd is from RAMQ itself who have also collected a useful series of videos on the SYRA system here (French only). Today the Régie de l'assurance maladie du Québec (RAMQ) officially certified our new billing software to be fully compliant with their new RFP (aka SYRA) billing system. We intend to start rolling out updates to our customers beginning in June, 2016. The latest versions of CareOffice and CareBook add several exciting new features to the scheduling module. Topmost is the ability to sync your appointments with any Apple or Android smartphone. New CareOffice (and CareBook) version. This release adds several exciting new features to the scheduling module. You now have the ability to define scheduling templates that cutomize appointment types for any given day, week, month etc. 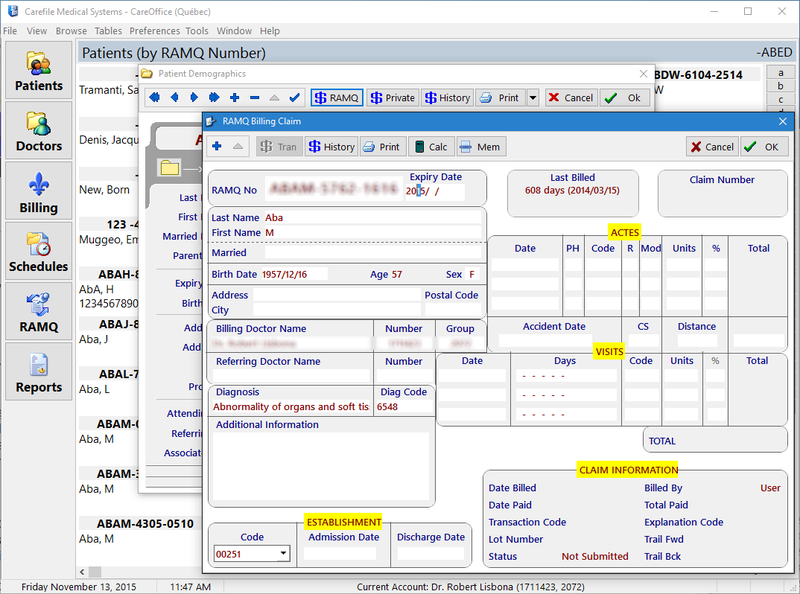 We also added an AutoAssign MRN feature when adding new patients. Please call for details. Now available! With this new version our Québec Windows billing packages have added support for anaesthesia billing as well as for the 'Vacation et Honoraires Forfaitaires' billing form. Please call for update information. Just added! The ability to attach audible reminders to each of your appointments.